2nd album title ‘BLUELOVE’ is expressing the emotion how CNBLUE feels about love. 1. Title song “LOVE” is a modern rock song with a shuffle rhythm. Has a combination of acoustic guitar and electric guitar that gives a cool and groovy attraction. You can feel CNBLUE’s unique rhythm. From 2nd verse, it’s changed to metal and you can feel Jung Yong Hwa’s powerful rap. 2. 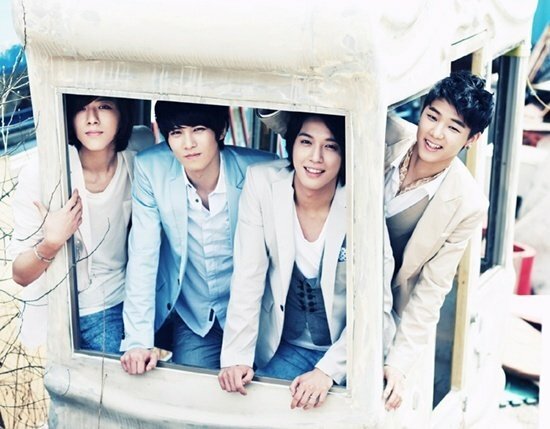 “Sweet Holiday” is cheerful rock number of CNBLUE’s style. Calm intro then changed to vital and cheerful beat. Drummer Kang Min Hyuk wrote the lyrics. He shows how a twenty-year-old boy feels the emotion of love. 3. “Black Flower” is of the rock genre. Minor song plus shuffle rhythm. You can hear Jung Yong Hwa’s powerful singing ability. 4. “Tatoo” has lyrics and composition by Jung Yong Hwa. It has strong sounds and funky elements. After refrain, the hook part expresses strong and pathetic feeling. 5. “Love Light” also had its lyrics and composition by Jung Yong Hwa. Acoustic guitar and Jung Yong Hwa & Lee Jong Hyun’s vocal are well mixed. It has a beautiful melody and lovely lyrics which makes your heart full of love. It’s a lovely song which makes listeners feel many emotions. 6. Let’s go crazy” is from CNBLUE’s first Indie album from Japan. It lets you enjoy a cheerful and powerful rhythm which Jung Yong Hwa’s unique vocal makes you want to listen to. This entry was posted on May 19, 2010 by redtofu. It was filed under Audio, CN Blue, News, Uncategorized and was tagged with CN Blue, comeback.